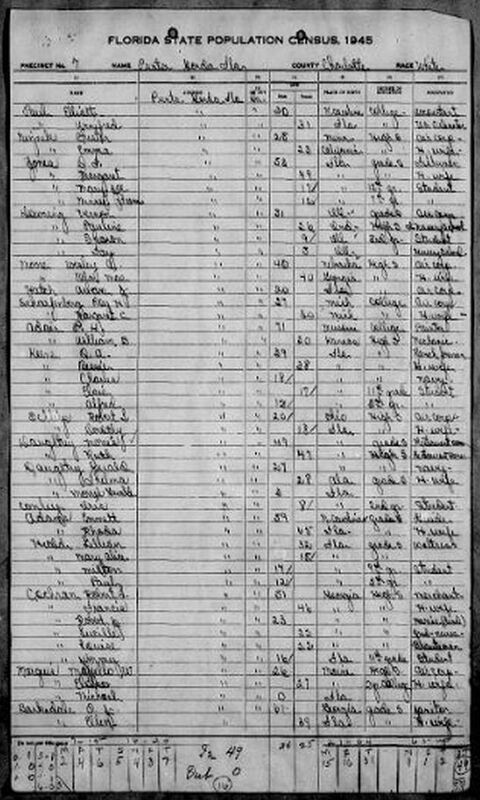 Our "Lukacs" family comes from, Hungary,1905 to NY. (Some people listed below & in below link may have Notes & Sources.). 1. Gabriel Lukacs. He married Mrs. Elizabeth Lukacs. + 2 i. Florian "Florsan" Lukacs was born 9 Aug 1880 in Czirak,(now called) Sopron,Hungary, and died 2 Sep 1956 in Wayne County, Michigan, USA. + 3 i. Elizabeth Lukacs. + 4 ii. Stephen P. Lukacs was born 10 Sep 1910 in Detroit, Wayne, Michigan, USA, and died 15 Nov 1971 in Royal Oak, Oakland, Michigan, USA. + 5 iii. Julius Lukacs was born 9 Feb 1913 in Detroit, Wayne, Michigan, USA, and died 4 Mar 1986 in Union Lake, Pontiac, Oakland, Michigan, USA. + 6 iv. Edward Lukacs was born 21 May 1918 in Dettroit, Wayne, Michigan, USA, and died 12 Oct 1975 in Dearborn, Wayne, Michigan, USA. 7 v. Matilda (Mattie) Lukacs was born 22 Aug 1920 in Detroit, Wayne, Michigan, USA, and died 8 Nov 2001 in Wyandotte, Wayne, Michigan, USA. 3. Elizabeth Lukacs (Florian "Florsan" Lukacs2, Gabriel Lukacs1). She married Joseph Vargo. He was born ABT 1899 in Czechoslovakia. 8 i. Living Vargo. She married Frank Hajkus. 9 ii. Living Vargo. She married Living Suessine. 4. Stephen P. Lukacs (Florian "Florsan" Lukacs2, Gabriel Lukacs1) was born 10 Sep 1910 in Detroit, Wayne, Michigan, USA, and died 15 Nov 1971 in Royal Oak, Oakland, Michigan, USA. He was buried Nov 1971 in Holy Sepulchre Cemetery,Southfield,Oakland Co.,MI. . He married Lorraine Edith Goehringer, daughter of Charles "Carl" Andreas Goehringer and Hermine (Minnie) Emile Auguste Ewald, also at same cemetery, Holy Sepulchre Cemetery,Southfield,Oakland Co.,MI. She was born 16 Apr 1914 in Detroit,Wayne Co.,MI, and died 18 Feb 1986 in Oxford,Butler,Ohio. She was buried in Holy Sepulchre Cemetery,Southfield,Oakland Co.,MI. + 10 i. J. M. Lukacs. 11 ii. J. A. Lukacs. She married J. Churchvara. 12 iii. Mary "Denise" LUKACS. She was born 05 Jan 1952 in Detroit, Wayne, Michigan, USA, and died 13 Dec 2012 in Sylvan Lake, Oakland, Michigan, USA. Denise was buried on 15 Jan 2013 at the Holy Sepulchre Cemetery, Wayne, Michgan, USA. 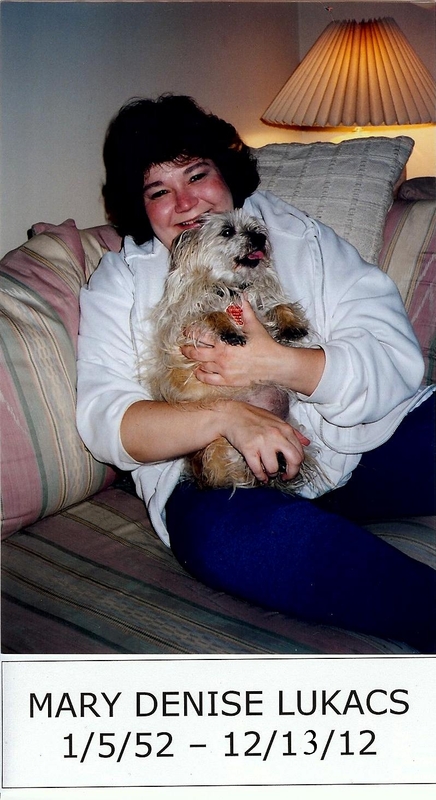 Denise loved dogs and was a pet instructor & pet trainer in business. 5. Julius Lukacs (Florian "Florsan" Lukacs2, Gabriel Lukacs1) was born 9 Feb 1913 in Detroit, Wayne, Michigan, USA, and died 4 Mar 1986 in Union Lake, Pontiac, Oakland, Michigan, USA. He married Gloria Nelson. 6. Edward Lukacs (Florian "Florsan" Lukacs2, Gabriel Lukacs1) was born 21 May 1918 in Dettroit, Wayne, Michigan, USA, and died 12 Oct 1975 in Dearborn, Wayne, Michigan, USA. He was buried in Holy Sepulchre Cem., Southfield, Oakland, Michigan, USA. He married Marie Marguerite Guertin. + 17 i. Living Lukacs. 10. J. M. Lukacs (Stephen P. Lukacs3, Florian "Florsan" Lukacs2, Gabriel Lukacs1). She married H.A. Hoyt, son of Hugh Huntington Hoyt and Elizabeth (Betty) Ann Miller. + 19 i. Living Hoyt. 20 ii. Living Hoyt. He married Living Weisgerber, daughter of Living Weisgerber and Living.Unknown. + 21 iii. Living Hoyt. 17. Living Lukacs (Edward Lukacs3, Florian "Florsan" Lukacs2, Gabriel Lukacs1). He married Living Amos. He married Living Goodson. 22 i. Living Lukacs. She married Living Sepke. 19. Living Hoyt (Living Lukacs4, Stephen P. Lukacs3, Florian "Florsan" Lukacs2, Gabriel Lukacs1). He married Living Nicholas, daughter of Living Nicholas and Living Unkmown. 21. Living Hoyt (Living Lukacs4, Stephen P. Lukacs3, Florian "Florsan" Lukacs2, Gabriel Lukacs1). He married Living R. R., daughter of Living Rayner and Living Unknown. 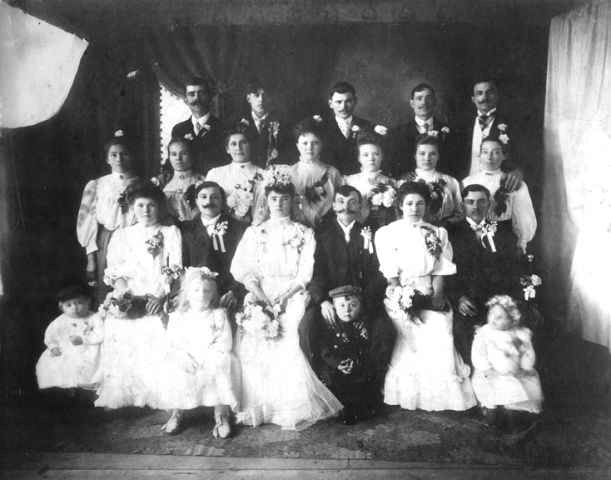 Lukacs: wedding photo with Anna & Florian seated first row middle. The gentleman in the top row on the very left end is Ed Saghy, Annas brother. He came over from Hungary first and then sent for Anna. 1. Edward SAGHY & Roza UNKNOWN, birth unknown, Roza is buried in Holy Cross Cem., Wayne Co., MI. 3. Anna SAGHY was born 18 DEC 1885 in Pápa-Teszér,(now Called) Papa,Hungary, and died 15 OCT 1964. She married Florian LUKACS 30 APR 1907. He was born 9 AUG 1880 in Czirak,(now called) Sopron,Hungary, and died 2 SEP 1956. + 4 i. Elizabeth LUKACS. + 5 ii. Stephen P. LUKACS was born 10 SEP 1910 in Detroit,Wayne Co.,MI, and died 15 NOV 1971. + 6 iii. Edward LUKACS. + 7 iv. Julius LUKACS. 4. Elizabeth LUKACS (Anna SAGHY1). She married Joseph VARGO. 9 i. Living VARGO. She married Frank HAJKUS. 10 ii. Living VARGO. She married Richard SUESSINE. 5. 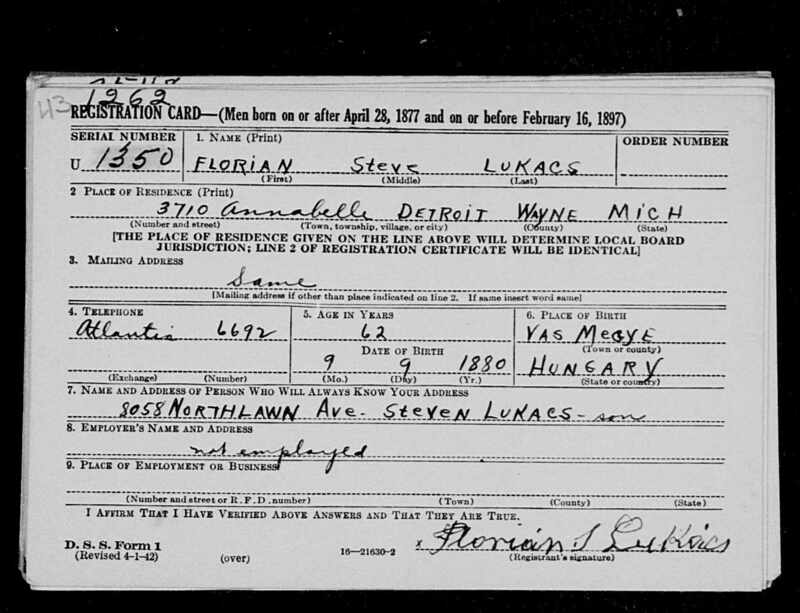 Stephen P. LUKACS (Anna SAGHY1) was born 10 SEP 1910 in Detroit,Wayne Co.,MI, and died 15 NOV 1971. He was buried NOV 1971 in Holy Sepulchre Cemetery,Southfield,Michigan. He married Lorraine Edith GOEHRINGER, daughter of Charles A. GOEHRINGER and Hermine (Minnie) E. EWALD. She was born 16 APR 1914 in Detroit,Wayne Co.,MI, and died 18 FEB 1996. She was buried in Holy Sepulchre Cemetery,Southfield,Oakland Co.,MI. + 11 i. J. M. LUKACS. 12 ii. J. A. LUKACS. She married J. CHURCHVARA. 13 iii. Mary "Denise" LUKACS. She was born 05 Jan 1952 in Detroit, Wayne, Michigan, USA, and died 13 Dec 2012 in Sylvan Lake, Oakland, Michigan, USA. Denise was buried on 15 Jan 2013 at the Holy Sepulchre Cemetery, Wayne, Michgan, USA. 6. Edward LUKACS (Anna SAGHY1). He married Marguerite GUERTIN. 7. Julius LUKACS (Anna SAGHY1). He married Gloria NELSON. 11. J. M. LUKACS (Stephen P. LUKACS2, Anna SAGHY1). She married H.A. HOYT, son of Hugh Huntington HOYT and Elizabeth (Betty) Ann MILLER. + 20 i. Living HOYT. 21 ii. Living HOYT. He married Living WEISGERBER, daughter of Living WEISGERBER and Living. + 22 iii. Living HOYT. 20. Living HOYT (Living LUKACS3, Stephen P. LUKACS2, Anna SAGHY1). He married Living NICHOLAS, daughter of Living NICHOLAS and Living. 22. Living HOYT (Living LUKACS3, Stephen P. LUKACS2, Anna SAGHY1). He married Living RAYNER, REVENEW, daughter of Living RAYNER and Living. 1. Johann Georg GOEHRINGER was born 1822 in Paffenhofen,[county],Bayern,Germany, and died 25 AUG 1872 in Detroit,Wayne Co.,MI. He married Margaret BIKLIN 1847, daughter of John BIKLIN and Ann UNKNOWN. She was born JUN 1823 in Germany, and died 17 DEC 1891 in Detroit,Wayne Co.,MI. + 2 i. Rosa Kunigunda GOEHRINGER was born 24 AUG 1847 in Paffenhofen,[county],Bayern,Germany, and died 28 MAR 1898 in Detroit,Wayne Co.,MI. + 3 ii. 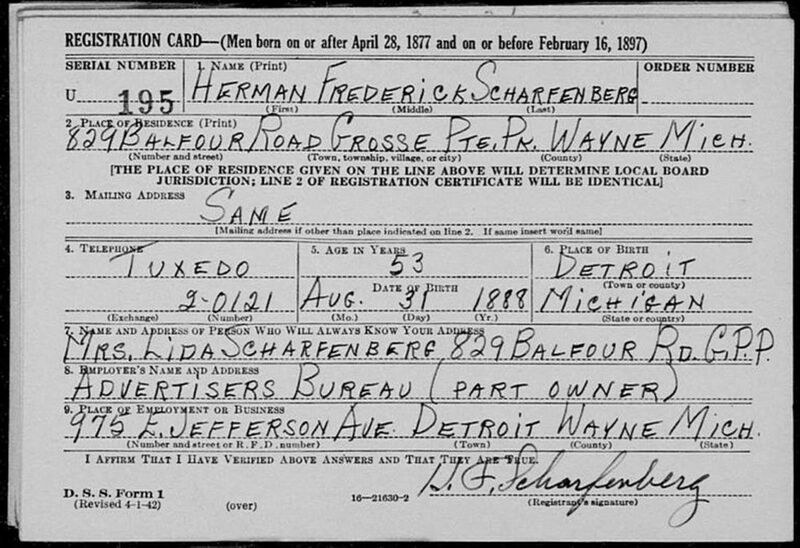 Andrew GOEHRINGER was born 28 OCT 1850 in Etzeldorf,[county],Bayern,Germany, and died 13 MAY 1903 in Detroit,Wayne Co.,MI. 4 iii. Margaret GOEHRINGER was born 10 JUN 1854 in Etzeldorf,[county],Bayern,Germany, and died in Detroit,Wayne,Michigan,USA. 5 iv. George GOEHRINGER was born 23 NOV 1859, and died 5 APR 1899 in Detroit,Wayne,Michigan,USA. + 6 v. John Leonard GOEHRINGER was born 30 JUN 1860 in Detroit,Wayne Co.,MI, and died 1944 in Detroit,Wayne,Michigan,USA. 7 vi. 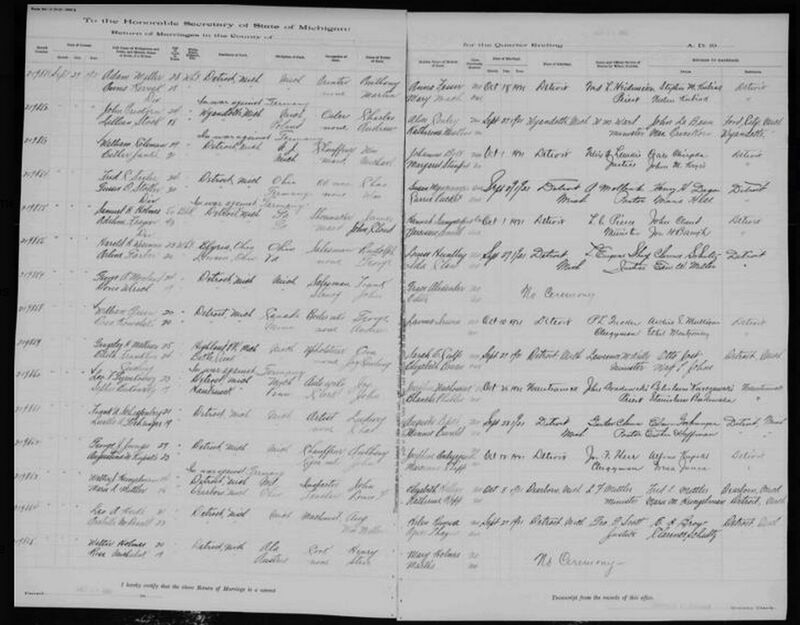 Jacob G. GOEHRINGER was born 26 JUN 1863 in Detroit,Wayne Co.,MI, and died in Detroit,Wayne,Michigan,USA. 8 vii. Johann Conrad GOEHRINGER was born 30 JUL 1866 in Detroit,Wayne Co.,MI, and died 11 OCT 1892 in Detroit,Wayne,Michigan,USA. 2. Rosa Kunigunda GOEHRINGER (Johann Georg GOEHRINGER1) was born 24 AUG 1847 in Paffenhofen,[county],Bayern,Germany, and died 28 MAR 1898 in Detroit,Wayne Co.,MI. She married Charles BECHT 23 OCT 1866. He was born 1839 in Germany. 9 i. Charles BECHT was born 1866. 10 ii. John BECHT was born 1869. 11 iii. Sigmond BECHT was born 18 OCT 1872. 12 iv. George H. BECHT was born 1875. 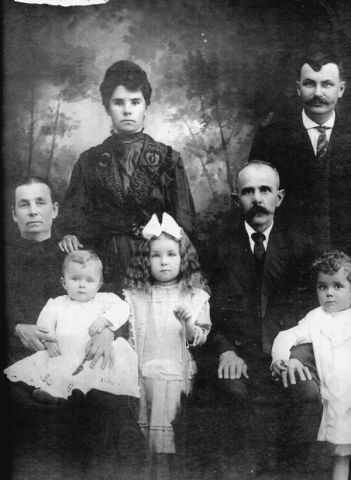 13 v. Rosa BECHT was born 1878. 14 vi. Anna Marie BECHT was born 20 JUL 1883. 15 vii. Fr BECHT was born 1884. 16 viii. Johanna Marie DORHEA was born 5 JAN 1889. 3. 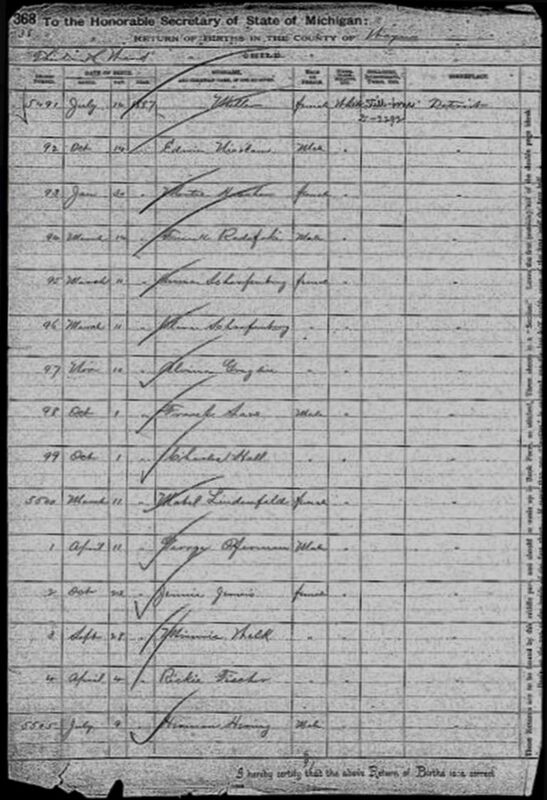 Andrew GOEHRINGER (Johann Georg GOEHRINGER1) was born 28 OCT 1850 in Etzeldorf,[county],Bayern,Germany, and died 13 MAY 1903 in Detroit,Wayne Co.,MI. 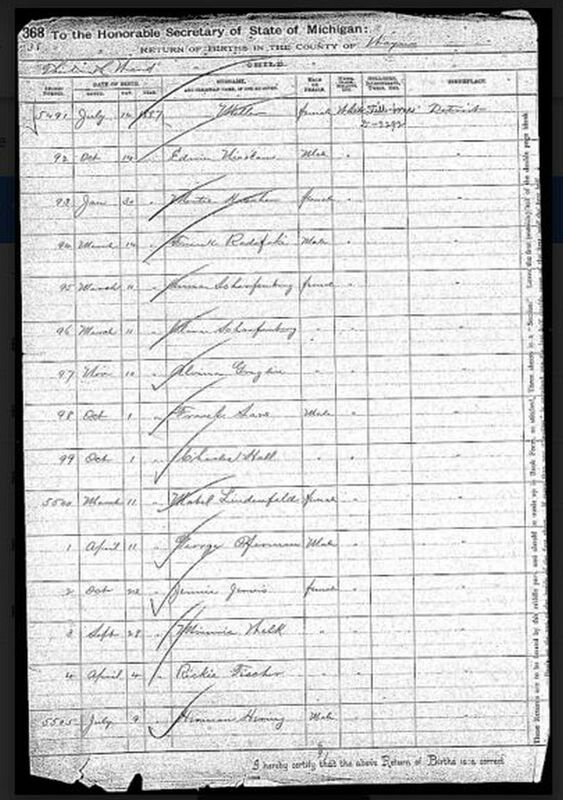 He married Katherine (Kate) KAUFMANN 8 JUL 1875 in Detroit,Wayne Co.,MI. 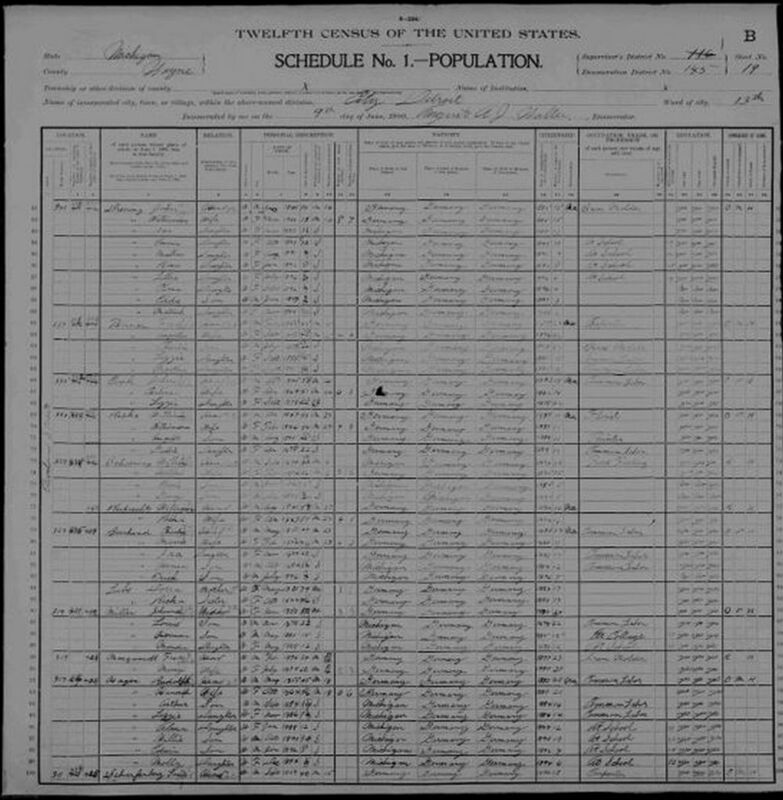 She was born 9 JUL 1853 in Rinbach,Hessin,Darnstard,Germany, and died 19 JUN 1911 in Detroit,Wayne Co.,MI. + 17 i. Charles Andrew GOEHRINGER was born 18 APR 1876 in Michigan,USA, and died 1938. 18 ii. Margaret (Maggie) GOEHRINGER was born 20 FEB 1878 in Detroit,Wayne,Michigan,USA. 19 iii. Anna GOEHRINGER was born 5 JAN 1880 in Detroit,Wayne,Michigan,USA. She married Fred W. DIXON. He was born 29 APR 1878, and died 5 APR 1939. 20 iv. Rose GOEHRINGER was born 26 DEC 1881 in Detroit,Wayne,Michigan,USA, and died 6 JUL 1959 in Detroit,Wayne,Michigan,USA. + 21 v. Herman John GOEHRINGER was born 30 JUN 1885 in Detroit,Wayne,Michigan,USA, and died 8 NOV 1944 in Melvindale,Wayne,Michigan,USA. 22 vi. Emma Johanna GOEHRINGER was born 25 SEP 1887 in Detroit,Wayne,Michigan,USA, and died 21 SEP 1888. + 23 vii. Albert Carl GOEHRINGER was born 25 FEB 1889 in Detroit,Wayne Co.,MI, and died 12 NOV 1949. + 24 viii. William C. GOEHRINGER was born 17 APR 1892 in Detroit Area,Wayne Co.,MI. 6. John Leonard GOEHRINGER (Johann Georg GOEHRINGER1) was born 30 JUN 1860 in Detroit,Wayne Co.,MI, and died 1944 in Detroit,Wayne,Michigan,USA. He married Minnie. He married Mary Marie SWITZER. 25 i. Emma J. GOEHRINGER. 27 iii. Julia GOEHRINGER was born 1886. 17. Charles Andrew GOEHRINGER (Andrew GOEHRINGER2, Johann Georg GOEHRINGER1) was born 18 APR 1876 in Michigan,USA, and died 1938. He was buried in Woodmere Cemetery,Detroit,Wayne Co.,MI. 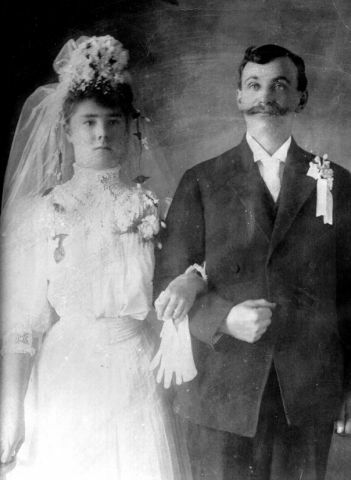 He married Hermine (Minnie) E. EWALD 28 MAR 1901 in Detroit,Wayne,MI. She was born Abt 1878, and died 12 JUN 1926. She was buried in Woodmere Cemetery,Detroit,Wayne Co.,MI. + 28 i. Luella (Ella) GOEHRINGER. + 29 ii. Elmer GOEHRINGER. + 30 iii. Carl A GOEHRINGER. + 31 iv. Mildred GOEHRINGER. + 32 v. Myrtle GOEHRINGER. + 33 vi. Lorraine Edith GOEHRINGER was born 16 APR 1914 in Detroit,Wayne Co.,MI, and died 18 FEB 1996. 21. Herman John GOEHRINGER (Andrew GOEHRINGER2, Johann Georg GOEHRINGER1) was born 30 JUN 1885 in Detroit,Wayne,Michigan,USA, and died 8 NOV 1944 in Melvindale,Wayne,Michigan,USA. He married Louise Elizabeth KUPKOWSKI 27 NOV 1907 in Detroit,Wayne,Michigan,USA. She was born 28 DEC 1885 in Detroit,Wayne Co.,MI, and died 30 DEC 1952 in Grayling,Crawford Co.,MI. + 34 i. Esther Louise GOEHRINGER. + 35 ii. Walter Herman GOEHRINGER. 36 iii. Gertrude M. GOEHRINGER. She married George LERMINEAU. + 37 iv. Alton Frank GOEHRINGER. 23. Albert Carl GOEHRINGER (Andrew GOEHRINGER2, Johann Georg GOEHRINGER1) was born 25 FEB 1889 in Detroit,Wayne Co.,MI, and died 12 NOV 1949. He married Minnie SCHROEDER. She was born 25 NOV 1890, and died 21 SEP 1962 in Dearborn,Wayne Co.,MI. +38 i. Glenn Albert GEHRINGER. 24. William C. GOEHRINGER (Andrew GOEHRINGER2, Johann Georg GOEHRINGER1) was born 17 APR 1892 in Detroit Area,Wayne Co.,MI. He married Martha F WOZNITKY. She was born 1 JUL 1896, and died 16 JUL 1976. 28. Luella (Ella) GOEHRINGER (Charles Andrew GOEHRINGER3, Andrew GOEHRINGER2, Johann Georg GOEHRINGER1). She married Frank SCHARFENBERG. 42 i. Ross SCHARFENBERG. He married Living. He married Judy. She died Deceased. 43 ii. Jim SCHARFENBERG. He married Doris. She died Deceased. 44 iii. Living SCHARFENBERG. He married Living. 29. Elmer GOEHRINGER (Charles Andrew GOEHRINGER3, Andrew GOEHRINGER2, Johann Georg GOEHRINGER1). He married Thelma. 45 i. Living GOEHRINGER. He married Living. 46 ii. Living GOEHRINGER. She married Living WOSAK. 30. Carl A GOEHRINGER (Charles Andrew GOEHRINGER3, Andrew GOEHRINGER2, Johann Georg GOEHRINGER1). He married Elizabeth KIMLEIN. 47 i. Living GOEHRINGER. He married Living. He married Dorothy. She died Deceased. 48 ii. Living GOEHRINGER. She married Donald WISSMAN. He died Deceased. 31. Mildred GOEHRINGER (Charles Andrew GOEHRINGER3, Andrew GOEHRINGER2, Johann Georg GOEHRINGER1). She married Stuart BROWN. He died Deceased. 50 ii. 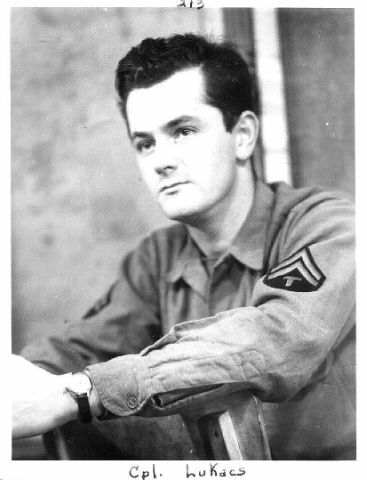 Charles (Skip) BROWN died Deceased. 32. Myrtle GOEHRINGER (Charles Andrew GOEHRINGER3, Andrew GOEHRINGER2, Johann Georg GOEHRINGER1). She married Robert TEAGAN. He died Deceased. 51 i. Living TEAGAN. She married Living SMITH. 52 ii. Living TEAGAN. She married Living DONOVAN. 53 iii. Living TEAGAN. He married Living. 54 iv. Living TEAGAN. She married Living ARPIN. 33. Lorraine Edith GOEHRINGER (Charles Andrew GOEHRINGER3, Andrew GOEHRINGER2, Johann Georg GOEHRINGER1) was born 16 APR 1914 in Detroit,Wayne Co.,MI, and died 18 FEB 1996. She was buried in Holy Sepulchre Cemetery,Southfield,Oakland Co.,MI. She married Stephen P. LUKACS, son of Florian LUKACS and Anna SAGHY. He was born 10 SEP 1910 in Detroit,Wayne Co.,MI, and died 15 NOV 1971. He was buried NOV 1971 in Holy Sepulchre Cemetery,Southfield,Oakland Co.,Michigan. + 55 i. Living LUKACS. 56 ii. Living LUKACS. She married Living CHURCHVARA. 34. Esther Louise GOEHRINGER (Herman John GOEHRINGER3, Andrew GOEHRINGER2, Johann Georg GOEHRINGER1). She married Henry Herman HOERL. 35. Walter Herman GOEHRINGER (Herman John GOEHRINGER3, Andrew GOEHRINGER2, Johann Georg GOEHRINGER1). He married Margueritte Mae THOMPSON. 37. Alton Frank GOEHRINGER (Herman John GOEHRINGER3, Andrew GOEHRINGER2, Johann Georg GOEHRINGER1). He married Mildred E. KOHN. She was born 8 OCT 1917, and died 14 JUN 1970. 38 i. Glenn Albert GEHRINGER (Albert Carl GOEHRINGER3, Andrew GOEHRINGER2, Johann Georg GOEHRINGER1). 65 i. T.L. GEHRINGER He married R. NELSON. 55. J. M. LUKACS (Lorraine Edith GOEHRINGER4, Charles Andrew GOEHRINGER3, Andrew GOEHRINGER2, Johann Georg GOEHRINGER1). She married H.A.HOYT, son of Hugh Huntington HOYT and Elizabeth (Betty) Ann MILLER. + 66 i. Living HOYT. 66 ii. Living HOYT. He married Living WEISGERBER, daughter of Living WEISGERBER and Living. + 67 iii. Living HOYT. 65. Living HOYT (Living LUKACS5, Lorraine Edith GOEHRINGER4, Charles Andrew GOEHRINGER3, Andrew GOEHRINGER2, Johann Georg GOEHRINGER1). He married Living NICHOLAS, daughter of Living NICHOLAS and Living. 67. Living HOYT (Living LUKACS5, Lorraine Edith GOEHRINGER4, Charles Andrew GOEHRINGER3, Andrew GOEHRINGER2, Johann Georg GOEHRINGER1). He married Living RAYNER, REVENEW, daughter of Living RAYNER and Living. * Privacy & ID Piracy Rules are now in effect for individuals born after 1930. I have had to drop dates and notes for persons between that time of 1930 and the present year, unless they have a death date. If you need to have these details for your family history records, please contact me personally for these sources by the email below.